Blogged up! : 3 Cloum Blogger Template Download!! 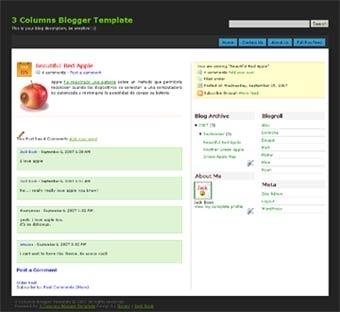 3 Cloum Blogger Template Download!! I hate Jackbook!!! Dont be amazed. I really hate that man(or group). Its not because they took my girlfriend or not because they made me jobless. Its because..... They Are So creative!!! Every Few days they are out with such a great templates and i hate them. But i have no option rather than promoting their template. Here is another three column template i borrowed from them. But before giving the download link to them, i want to give them a kudos. Light green, yellow and an apple. This template is amazing. I am sure this template is enough to make a geek blog look cool. so without revealing much information about this template i would like you to check it and use it. So this one is for today and i hope i will give you another template ............. when jackbook will create one!!!! !